Objective: To evaluate poly(GP), a dipeptide repeat protein, and neurofilament light chain (NfL) as biomarkers in presymptomatic C9orf72 repeat expansion carriers and patients with C9orf72-associated frontotemporal dementia. Additionally, to investigate the relationship of poly(GP) with indicators of neurodegeneration as measured by NfL and grey matter volume. Methods: We measured poly(GP) and NfL levels in cerebrospinal fluid (CSF) from 25 presymptomatic C9orf72 expansion carriers, 64 symptomatic expansion carriers with dementia, and 12 noncarriers. We explored associations with grey matter volumes using region of interest and voxel-wise analyses. Results: Poly(GP) was present in C9orf72 expansion carriers and absent in noncarriers (specificity 100%, sensitivity 97%). Presymptomatic carriers had lower poly(GP) levels than symptomatic carriers. NfL levels were higher in symptomatic carriers than in presymptomatic carriers and healthy noncarriers. NfL was highest in patients with concomitant motor neuron disease, and correlated with disease severity and survival. Associations between poly(GP) levels and small grey matter regions emerged but did not survive multiple comparison correction, while higher NfL levels were associated with atrophy in frontotemporoparietal cortices and the thalamus. 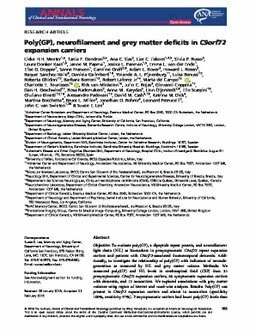 Interpretation: This study of C9orf72 expansion carriers reveals that: (1) poly(GP) levels discriminate presymptomatic and symptomatic expansion carriers from noncarriers, but are not associated with indicators of neurodegeneration; and (2) NfL levels are associated with grey matter atrophy, disease severity, and shorter survival. Together, poly(GP) and NfL show promise as complementary biomarkers for clinical trials for C9orf72-associated frontotemporal dementia, with poly(GP) as a potential marker for target engagement and NfL as a marker of disease activity and progression.